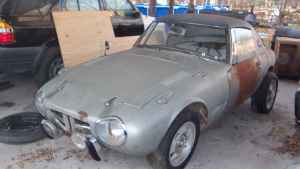 1967 Toyota Sports 800 - This is one incredibly rare car. Just 3131 of these were built. Only 300 were LHD. Of the total 3131 cars built, only 10% are believed to still exist. This is a project. A big time project. The car looks to be relatively complete. It has been set up to take a Corolla engine and transmission, as, according to the seller, "it is almost impossible to get an original engine". If you're brave enough to take it on, this would be a really cool car once it's restored. The seller doesn't state in his ad how much he wants for the car, but on a Toyota forum $3500.00 is mentioned. Located in San Antonio, TX, click here to see the Craigslist ad. Click here to see a video of a restored Sports 800. 1965 Riley Elf - A Mini with a trunk and a formal grille. Personally, I can't decide whether or not I like the trunk, but I love the nose. 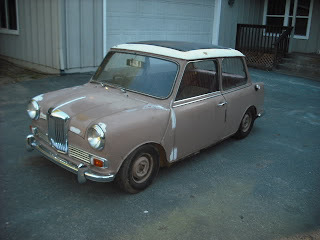 This car needs some restoration, but the seller says "you can drive it home and drive while you finish it". A great car if you want a Mini, but want to stand out in a crowd. 1973 Triumph Dolomite Sprint Race Car - On the short list of cars I'd like to own one day is the Triumph Dolomite Sprint. It was never sent to the US and LHD cars are few and far between. This is a RHD Dolly that has been set up for racing. According the seller, it is the only Dolomite Sprint racing in the United States. I want one I can drive on the street, but if you're looking for a really cool, unique race car, this may be the car for you. Located in Clyde, NC, click here to see the eBay listing. The seller of the Dolomite is also selling a 1968 Ford Cortina MKII with a Cosworth 2.8 V-6 in it. It's also set up for racing. See the eBay listing here. 1977 Ford Granada - This car has claimed 7000 miles on it. That's an average of 205 miles per year... 17 miles per month... A half a mile a day. With a 6 cylinder engine, automatic transmission, vinyl bench seat, AM radio and no air conditioning, it's pretty easy to see why the miles are so low. The question is, why did the owner (it's a 1 owner car) keep it for so long? Believe it or not, Ford tried to compare these cars to the Mercedes-Benz 450SLC. Located in Birmingham, AL, click here to see the eBay listing. Toyota - I had no idea that this car existed. I thought everything started with the 2000. ...I think of the audacity of making a wagon out of such a small car, hence the Countryman. The wood trim only adds to the appeal. The same goes for the sport versions, such as the Cooper. You can earn bonus points for vans, pickups, and thinking of the Italian Job. In brief, a car that certainly was designed by a smart alec. Unfortunately, I can't think of a damn thing when I see a Riley Elf. Dolomite - I just read the Wiki on this, as I mixed this up with the 2000/2500. It seemed to have a lot going for it initially, and it's a shame that it suffered from the usual BL crap. Granada - There are quite a few print ads available online regarding the Grenada. Better yet, try typing "Grenada" "commercial" and "Ford" together in the YouTube search box. Geek, I may be wrong, but isn't the model in the ad you posted a rare AMG version? ...type "Granada," not "Grenada" in the YouTube box. "Smart alec" wins you "pun points".